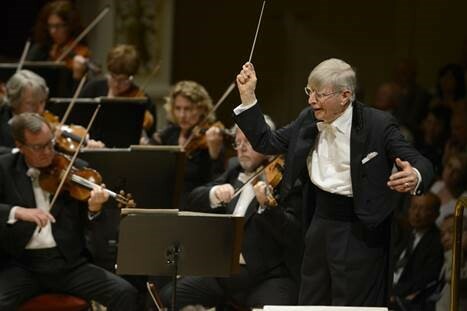 Happy birthday, Herbert Blomstedt and thank you. You’re 90 years old this week and gave me a very important seed2lead that I’ve been profiting from and now it’s time to share my learnings from you with others. You were the guest conductor at the Munich Philharmonic in May, 2016. I was in the audience. You were 89 at the time, still appeared in fine working order as you came onto the stage that night. You told us that you were going to lead the orchestra through several pieces of music, the first being Poesis, by Igvar Lidholm. As you took the podium, several rounds of applause followed. You cleared your throat and said that the music from Ingvar Lidholm may not be everyone’s favorite, because it’s so complex. You went on to say that you wanted to explain his music in more detail so that we could listen to Poesis with more perspective and perhaps be able understand and appreciate Lidholm’s music in a deeper way. You then proceeded to explain the piece for nearly 20 minutes, or maybe longer. Your explanation and insights certainly weren’t boring, but I simply couldn’t believe that you could take 20 to 30 minutes to explain a piece of music that probably wasn’t going to be played as long as you were taking for the explanation. Yet you did this with such passion, conviction and purpose that I felt like this must be the most important piece of music ever written. You captivated me and the rest of the audience that night. Then the orchestra played Lidholm’s Poesis. Complex, contemporary and without a predictable melody, this music wouldn’t usually make any sense to me. But after your explanation, I now knew how to listen, how to anticipate and how to make sense of what I was hearing. You helped bring context and meaning to something that would have been completely foreign to me only an hour earlier. By you going slow, I was able to go fast. It reminded me of the many strategy sessions that I sit in on; where leaders move into complicated business strategies, fueled by abundant power point slides, choked with numbers and graphs. I hear lots of information at these sessions, but real passion, conviction and purpose isn’t always easy for me to identify. When I scan the room and observe the other executives during these sessions, I rarely see or feel the emotional connection that I felt in the audience that night. It’s not often I hear or see the “front load” to the strategic story or clearly understand the why. My seed2lead that night was to remember how important it is to provide context, purpose and personal meaning to complicated strategies and business plans up front. Help people understand the “music” before it’s played. There is no shortage of brain power in the executive teams that I advise, and I am certain these executives will be more influential and effective when they practice what you shared with us. I learned a lot from you on that May evening in 2016. When you want to engage people, get them involved and take ownership to complicated strategies and business plans, take the time up front and set the context and opportunities with purpose and passion. Thank you Herbert, for this lesson and happy 90th birthday to you; I hope you have many more in front of you! Herbert Blomstedt Photo Copyright Matthias Creutziger, used with permission.